Home › Current News › Special Christmas Message From The Silvers! 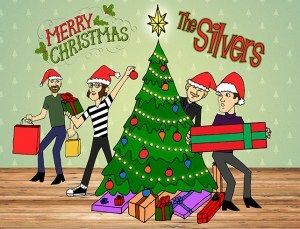 Special Christmas Message From The Silvers! If you haven’t heard it already, here is a special Christmas message from The Silvers featuring Glenn, Ricky, Tom and Mick. Click on the link above. After a long day of recording our new song in “Studio Zero”, the four of us took time to lay down this holiday message. We did a rush to get the Christmas Song recorded and mastered by December 1. And here is our thank you to go with it. Now someone go get Tom out of that super sonic echo chamber before he catches cold!